Eat Bulaga, one of the most successful and long-running noon time shows broke down the chain of body stereotyping with its recently concluded beauty pageant known as FHHM (For Heavy and Healthy Models) hailing Liana Ella Kuzma as the winner, besting the 12 other beautiful and voluptuous candidates last Saturday, October 4, 2014. 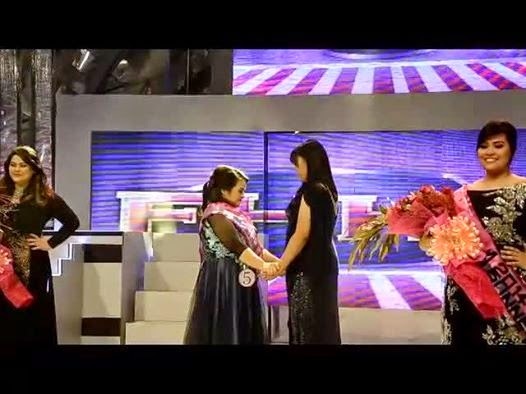 The beauty pageant's concept is fresh and new as it aims to advocate social acceptance of plus size women in the country, condoning the social stigma of “The Thin Ideal,” educating rather the society that beauty comes from shapes and sizes. It is but unfortunate that there is still sizeism in the Philippines for which the media portrays thinness or sexiness as a desirable trait, and that being thin makes a woman more beautiful, sought-after, and successful. We see that in billboards, commercials, magazines and sadly, this realization is very glaring. That’s why slimming regimen, weight loss programs, and fat-reducing products is a booming business in the country. It should be known that this body stereotyping directly leads to prejudice and discrimination; thus, leading to a great deal of pressure to plump or obese women. Most often than not, these heavy people find themselves as subjects of ridicule, influencing them to have a tremendous desire to diet and work themselves thin just to be socially accepted. According to Wikipedia “people who more strongly believe that fatness results from lack of willpower are more likely to be prejudiced against fat people. This only relates that obese persons are lazy, lack self-discipline, and have poor willpower, but also possess defects of intelligence and character," which is entirely wrong! Physical appearance and weight shouldn't be the grounds of measurement to summarize one’s character and intelligence. The folds of fat will not justify you, attitude does. We should embrace and conform into a non-standard body for which we are confident with what we have, fats and all. Being curvy, voluptuous or heavy is not something to be ashamed of. Being healthy and beautiful doesn't need to compromise one’s wellness to undergo into an extreme torture of diet and working out just to be socially accepted. It is about time to advance our society by having a just and fair treatment to all especially when it comes to the definition of what beauty is. Let’s free ourselves from complexes by setting up as an example and showing that you can lead a very full life, even as someone with a large figure.